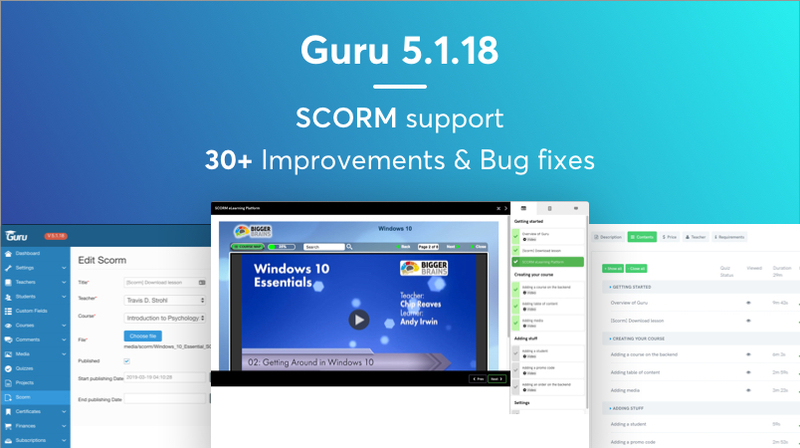 New version of Guru Joomla LMS extension is updated for major new feature: SCORM eLearning platform support and 30+ new features, improvements & bug fixes. SCORM (Sharable Content Object Reference Model) is a set of technical standards for eLearning products. It provides the communication method and data models that allow eLearning content and LMSs to work together. It tells programmers how to write code so that what they build will “play well” with other eLearning software. SCORM is the most widely used eLearning standard available. How SCORM works with GURU? By integrating SCORM, administrator and teacher can add new scorm ZIP files in any course lesson from back-end and front-end. We added one panel to manage SCORM files. From back-end, access the Scorm menu item then you can create new scorm file. For each SCORM file, you have to assign it to specific teacher and a course of the teacher. Then the scorm file will be only available to be added in lessons from assigned course. Access the Course management panel, open the course to add lessons with SCORM File. Add lesson details (name, level…) and most important select the “Scorm” layout, from General Tab. Select “Scorm” button then select a SCORM file from assigned to this course. If you don’t have already a scorm file for the course, you can click on “New Scorm” and create a SCORM file for the course and add to the lesson. Open the course page in front-end, as a student, and in that course lesson, you can see the Scorm content. The saved details for lessons and scrom files is stored in Guru database tables. See how the feature work in action. On front-end, teacher can add SCORM files for lessons for their courses. Log in front-end with teacher account. Go to teacher dashboard, and there is a new menu item – Scorm. Teacher can add/edit/delete scorm files from that page and the scorm files added are available only for that teacher. Go to “Courses” page and edit tree for one course. Add new lesson or edit a lesson already created. From “Layout” tab, select Scorm icon, and then select a scorm file or you can create a new scorm in lesson page. Implement Projects Results in back-end.